If you're a sports fan, there's nothing quite like kicking back on the couch, cracking open a cold one and watching your favorite team rise triumphant over the other guys. For the longest time, it was thought that the only way to have such an experience was via a TV coupled with a cable or satellite subscription. That's because, for the most part, sports are best enjoyed live, and watching live TV hasn't always been the province of cord cutters. Things have changed in the past few years, however. Not only can you now stream most live sports on your computer or your smartphone, but you don't even need a cable or satellite provider to do so, which can potentially save you plenty of money. Yet the process is less easy than you'd think -- it depends a lot on what sport you're into and which teams you support -- and there are occasionally local blackouts to contend with as well. But with the cord-cutting movement gaining momentum recently, it's now a lot easier to watch live sports online than it's ever been, as long as you know what to look for. For the purposes of this guide, we decided to focus on the five major sports that are most often watched live -- American football, baseball, basketball, ice hockey, and domestic and international soccer -- though we also offer information about other sports like tennis and golf where relevant. By far the easiest way to watch live sports over the internet is to essentially replicate the cable or satellite TV experience with an online equivalent. These stand-alone streaming TV services, also known as "skinny bundles," look and feel almost identical to a basic cable package, which means they also often have the same standard sports channels, like ESPN, Fox Sports and your regional sports network. Unfortunately, however, not all skinny bundles offer the same channels, so it's worth knowing which carry the ones you care about. For the most part, you'll want services that offer local broadcast channels (that's Fox, NBC, CBS and ABC) as well as cable mainstays like ESPN, Fox Sports, TBS and TNT to get nationally broadcast games (TBS and TNT are especially important during the NBA postseason). If you want to watch local games, you'll also want a service that carries a regional sports network, in order to avoid blackouts. So if you live in San Francisco, for example, you'll want it to carry NBC Sports Bay Area to watch the San Francisco Giants or the Oakland A's. If you're a New York Yankees or Brooklyn Nets fan and you live in New York, you'll want it to carry the YES Network. Then there are league-specific networks like NBA TV and MLB Network, which don't show all games all the time, but could also be valuable if you're a fan of a particular sport, since they do have preseason or minor league content you can't get elsewhere. (MLB Network, for example, shows plenty of spring training games prior to baseball season.) MLB Network also sometimes airs postseason games -- in 2012, it showed Game 2 of the AL Division Series and Game 2 of the NL Division Series exclusively on its network. As far as live games go, however, they're only useful for catching the occasional out-of-market game. The NFL Network airs only Thursday Night Football games, as well as the ones in the preseason. There's also an NFL RedZone channel that provides "whip-around" simulcast live look-in coverage of all Sunday afternoon games that are in progress. It's especially useful for those who are into fantasy football, as it provides live statistics and you can keep an eye on several games at once. NBA TV shows at least 90 games per regular season, and the NHL Network broadcasts up to 80 games in a regular season. MLB Network airs a lot more -- there are, after all, a lot more baseball games in a year -- but even then it's only about a dozen or so a week. Unfortunately, these games are still subject to local blackout restrictions. If you really need to watch lots of out-of-market games in these sports, we suggest looking at the sections below on league-specific services and other apps. One of the latest big companies to join in the skinny bundle trend is DirecTV, whose online TV service starts at just $40 a month and goes all the way up to $75 a month. At the lower end, the $40 Live a Little bundle carries ESPN, ESPN2, FS1, NBC Sports, TBS and TNT, as well as local broadcasts where available. The $55 Just Right bundle adds ESPNews, ESPN U, MLB Network, NFL Network, SEC Network and the Tennis Network, plus regional sports networks, while the $65 Go Big package throws in FS2, NBA TV, NHL Network, CBS Sports, Golf Network and the Olympic Channel. (The $75 package adds in a slew of Starz channels as well as Boomerang and Univision Deportes). The basic bundle here costs about the same as the other options in this list, but it does get considerably more expensive once you level up a tier or two. Pros: Pretty good selection for most sports enthusiasts. Cons: It costs $65 if you want to get all the major sports channels. If you're a soccer fan, FuboTV is without doubt the best online streaming service for you. It offers more than 10 different ways to watch international soccer via beIN Sports, including channels in Spanish and Portuguese. But that's not all: Over the past few months, FuboTV has really beefed up its other offerings too, of both the sport and non-sport varieties, like A&E and AMC. The basic 75-channel package brings you CBS, Fox, NBC, TBS, TNT, regional sports networks, FS1, NFL Network, NBA TV, Pac-12 Network, Golf, Big Ten Network, FS2, Olympic Channel and Eleven Sports (It's $39.99 for the first month and then $44.99 per month thereafter). For an extra fee of $6 to $13, you can add additional sports bundles that have channels like Fubo Cycling, Fox Soccer Plus, NFL RedZone, Fox College Sports, GOL TV and TyC Sports. It doesn't have the MLB Network or the NHL Network, however, and, perhaps the biggest downer, it doesn't carry ESPN or any of the Disney networks. But FuboTV certainly wins in terms of sheer soccer content and offers plenty of NFL and college football options to boot. Here's a complete list of sports covered by fuboTV. Pros: The best choice for international soccer fans, with lots of NFL and college football options as well. Cons: The omission of ESPN is a big drawback. Hulu is one of the latest to join in the online TV streaming field with its live service, and it offers a compelling sports package for $40 a month. You'll get the local live broadcast networks (Fox, CBS, NBC, ABC) where available, TNT, TBS, ESPN, ESPN 2, ESPNews, ESPN U, FS1, FS2, Golf Channel, the Big Ten Network and NBC Sports, as well as regional sports networks. Still, there's no NFL Network, no MLB Network, no NHL Network and no NBA TV, so you won't get any extra coverage of preseason games, for example. Pros: It airs most major games live, which should be fine for most people. Cons: If you want detailed coverage of out-of-market games, you might want to look elsewhere, or supplement Hulu with one of the sport-specific apps listed below. Despite its name, the PS Vue live streaming TV service is available on more than just PlayStation consoles -- it's on a variety of set-top boxes like Roku and Amazon's Fire TV, as well as iOS and Android. PS Vue splits its service into four different tiers; Access has the fewest channels and is the cheapest, at $40 a month, which gets you ESPN, ESPN2, FS1, FS2, NBC Sports, TNT and TBS. But ramp it up to Core ($45 a month) and you'll get a lot more sports-focused content: CBS Sports, Big Ten Network, ESPNews, ESPN U, Golf, MLB Network, NBA TV, regional NBC Sports networks, NFL Network, Olympic Channel and the ESPN SEC network. PlayStation also offers pricier Elite and Ultra packages, for more languages and premium movie channels, but the Core package should satisfy most sports fans. The only variable here is that PlayStation warns that local live broadcasts aren't available in all markets, so you might have to fall back on the ol' antenna every once in a while. Pros: Comprehensive coverage for most sports fans at a reasonable price. Cons: Local live broadcasts aren't available in all areas. Sling TV offers three different packages: Orange, Blue (each for $25) or a combination of the two for $40. All of them have TBS and TNT, which are important for the MLB and NBA postseasons, respectively. Orange has ESPN, ESPN 2 and ESPN 3, while Blue has FS1, FS2, NFL Network and NBC Sports, as well as regional Fox and NBC channels in select markets. Unfortunately, however, Sling TV does not carry CBS, which is a bummer if you want to catch certain NFL games. Sling TV does offer specialized networks like NBA TV, NHL Network, beIN Sports (for international soccer), the Golf Network and various college sports networks (SEC Network, Pac-12 Network and ESPN U). That said, you'll have to cough up $5 to $15 extra, depending on which sports package you want. (Orange has the college ESPN networks, while Blue has NFL RedZone, for example.) 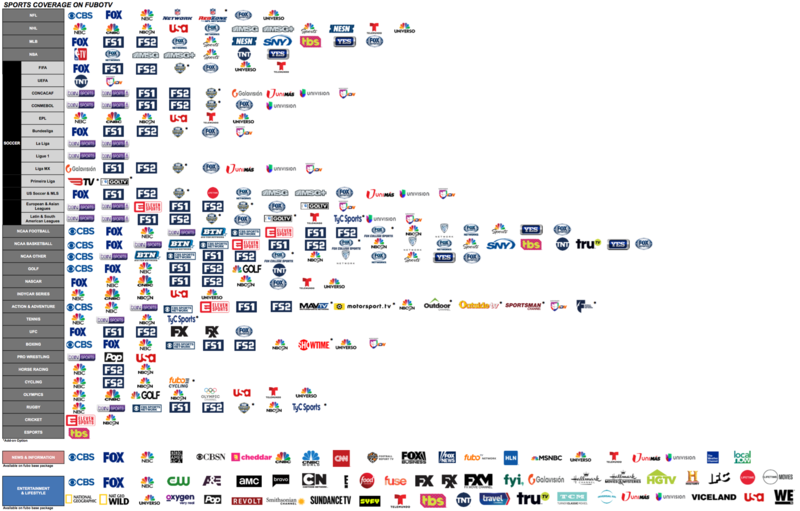 Notably lacking is MLB Network, which isn't offered at all. Sling TV is perhaps the most inexpensive of the lot if you don't mind cherry-picking certain channels over others -- if you only care about basketball, for example, then the $25 Orange package should suffice -- but not so much if you want a wide range of options. Pros: Sling is perfect for budget-conscious cord cutters, especially if you're more interested in some channels than others. Cons: Sling TV doesn't carry CBS or MLB Network, which means you might not be able to catch certain NFL or out-of-market baseball games. Last but not least, there's YouTube TV, which offers a decent array of sports channels for $40 a month. It airs local CBS, NBC, ABC and Fox affiliates where available, as well as TBS, TNT, ESPN, ESPN 2, SEC Network, ESPN U, ESPNews, FS1, FS2, NBC Sports, regional sports networks, NBA TV, MLB Network, CBS Sports, Golf Channel, Olympic Channel and the Tennis Channel. Pros: YouTube has a simple, no-frills approach, wherein every subscriber gets access to all the sports channels without having to select special packages or tiers. Cons: Still not available in some markets. But let's say you don't want to go through the hassle of signing up for a streaming TV replacement and you just want to watch a specific sport or channel. There are a few options here as well, but be warned: Your choices are limited. If you care deeply about watching out-of-market NBA basketball games, consider NBA League Pass. The subscription lets you watch all regular season games, except for the ones in your local market, which are blacked out. But it's pretty expensive. The regular package costs $29 a month, and if you care about an "In-Arena Stream," where you can watch what's happening during timeouts, you'll have to shell out $40 a month. Following just one team costs $18 a month, but, as we mentioned, you can't watch your local team play live, due to blackouts (this applies to both local and national broadcasts). The other big downside is that you won't be able to use NBA League Pass to watch the NBA Playoffs and Finals, so you're left either scrounging around for an antenna to watch the games on ABC or finding a friend with a cable sub. One of the very first leagues to offer online streaming deals was MLB, and it's still doing so today. As with all the other league services, local games are blacked out, so MLB.TV is valuable only if you're following an out-of-market team. MLB.TV will cost you $116 per year or $25 a month. A single-team subscription costs $90 a year. Hockey fans have NHL.TV, which works very similarly to MLB.TV and NBA League Pass. You can watch all out-of-market games but not local-team broadcasts. It's pretty pricey, however, at $140 a year, and following a single team doesn't even save you much money, at $112 a year. Like the other leagues here, MLS used to have its own league pass, called MLS Live. These days, however, it's bundled right in with ESPN+, an app with a stand-alone subscription of $5 a month (more on this below). Thankfully, a lot of MLS games aren't subject to the same blackout rules as other sports leagues, so you can easily catch several games a week. The NFL doesn't have a league pass like the NBA or MLB, but there are a few ways to watch a handful of games online. Since 2017, you are able to watch Thursday Night Football on Amazon via its Prime subscription or, if you want to watch it for free, it also airs via Amazon's own Twitch service. Thanks to the NFL partnership with Verizon, you can also now watch in-market games and national broadcasts via the Yahoo or Yahoo Sports app on all mobile platforms, regardless of carrier. Out-of-market games on Sunday are still off the table, however. You can also subscribe to DirecTV's NFL Sunday Ticket online, which lets you watch every out-of-market Sunday afternoon game for $75 a month. But it comes with a few significant caveats: You have to live in a multi-dwelling unit, one of several select cities or a home that otherwise can't receive satellite or cable service, or be a college student. ESPN+ marks the first-ever network to have a stand-alone app. For just $5 a month, you'll get access to a plethora of MLS games, certain MLB and NHL games, PGA Tour golf, college sports, boxing, rugby, cricket, lacrosse and a selection of international soccer matches like EFL, UEFA Nations Cup, USL, Serie A (Italy) and the FA Cup. You'll also be able to stream several ESPN originals, like 30 for 30 and SC Featured. Fans of Premier League football might want to check out the $50 Premier League Pass on the NBC Sports Gold app, where you can watch 150 live and on-demand games throughout the season. However, this doesn't cover all Premier League games. In fact, the ones that show up on the app are likely to be games played by low- to mid-tier teams, which you probably don't care as much about. If you want to watch big-name teams like Manchester United or Arsenal every week, you'll probably need to supplement the Sports Gold pass with a cable package or one of the above OTT services. Facebook and Major League Baseball struck a deal earlier this year that gives the social network exclusive broadcast rights to 25 games in the regular season. They apply only to day games in the middle of the week, and add up to only a handful of games per month. But as long as you have a Facebook account, you'll be able to watch these games for free. Update 11/14/2018 4:35PM ET: Amended fuboTV details.